AroonUp crosses AroonDown upwards — bullish signal. AroonDown crosses AroonUp downwards — bearish signal. AroonUp and AroonDown move in parallel lines — consolidation period. Aroon indicator is a young one, developed by Tushar Chande in 1995. Aroon was created to measure strength of a trend and potentials for its continuation as well as the quality and type of the trend: up-trend, down-trend or sideways moving market. There are two parts to the Aroon Indicator – two coloured lines: Aroon up (red line) and Aroon down (blue line). The Aroon indicator scale ranges from 0 to 100. There are 4 important levels to monitor when trading with Aroon indicator: 0, 30, 70 and 100. The default time period for Aroon indicator is 25, on some panels - 14. But, it can be changed to, for example, 10-periods for shorter term trades or to 50-periods for longer ones. How to trade using Aroon indicator? 1. When AroonUp crosses AroonDown upwards it is a bullish signal. 2. When AroonDown crosses AroonUp downwards it is a bearish signal. 1. When AroonUp reaches the 100 level the uptrend is clearly strong; the closer it remains to the top the stronger the uptrend. 2. When AroonUp line fluctuates between 70 and 100 levels it suggests a Potential uptrend. The signal becomes stronger if at the same time AroonDown remains between 0 and 30 levels. 3. When AroonUp line fluctuates between 0 and 30 levels it suggests trend weakness and a possibility of a trend reversal. 1. When AroonDown reaches the 100 level it suggests downtrend being strong; the closer it remains to the top the stronger the downtrend. 2. When AroonDown line fluctuates between 70 and 100 levels it advices on a Potential downtrend. The signal becomes stronger if at the same time AroonUp fluctuates between 0 and 30 levels. 3. When AroonDown fluctuates between 0 and 30 levels it suggests trend weakness and possible future trend reversal. Aroon indicator shows how much time passed between the highest (up) or lowest (down) close since the beginning of a period (in percents). As market changes, traders adjust their trading approaches and methods from trend following to tools used during market consolidations. Aroon indicator helps traders to determine when to use a trend following indicators and tools and where to switch to oscillator like tools that work best in consolidating markets. One of the major problems of the aroon indicators is the arbitrary time period. If you vary the period, from say 25 to 15 days, you get a second diagram that appears to be, essentially, offset from the first, therefore giving completely different signals! If you vary the period to fit the past data (! ), there's no assurance that it will fit future data. There is no "holy grail" when it comes to indicators. The best thing is to use multiple indicators for confirmation. It is also important to understand the formula used to calculate each indicator, to avoid using linear variations of the same algorithm which, of course, would yield the same result instead of valid confirmation. pls how can i download this indicator? can u provide the mq4 file for this indicator for download? Very Cool indicator !! THANK YOU SO MUCH. plis give us the exemple for aaron formula.......oke? All Indicators are useful. The problem is that you should know how to use, i mean how you read the indicator you are using. 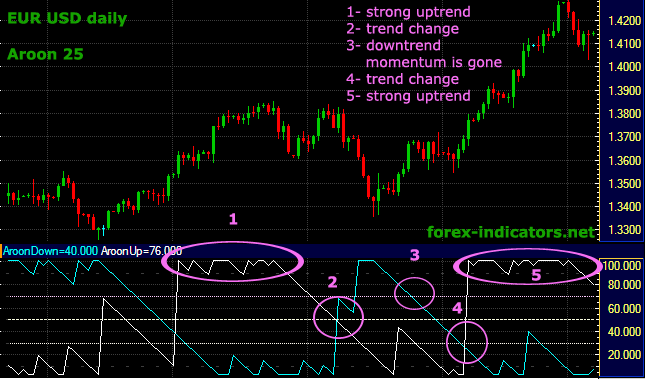 I have a set up of twelve indicators. I use all at the same time one by one. The results are fine. According to the experience I've has this indicator, which I appreciate, It's very helpful to use when taking a trade position, not that much good when exit the trade. How can I calculate strong up trend (1 and 5 on graph.) length? How many days or hours? 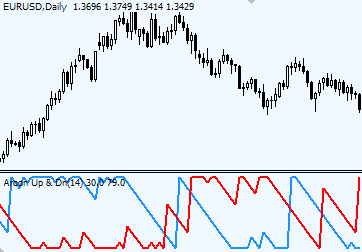 Which indicator or something else can be used for confirmation of up trend period length? Very good indicator. Good results.